Over the years, we have developed lots of great ideas and strategies related to handwriting for kids. Here are some of our best hints and tips! One of the most common reasons kids are referred for occupational therapy assessments and interventions in schools is because they struggle with handwriting. Kids can have difficulty with many aspects of this important skill, including letter formation, hand strength, maintaining spacing and sizing, and keeping their writing on the lines. There are many simple ways to support kids as they develop handwriting skills in the classroom and at home. 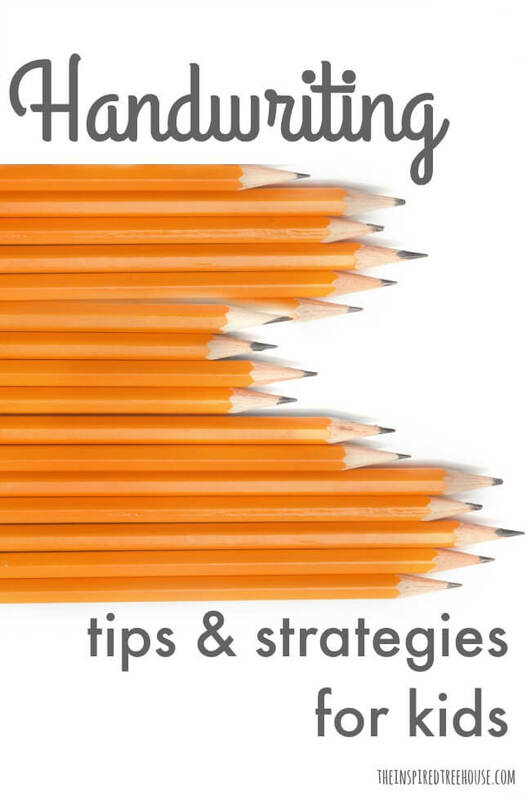 1 || 6 Easy Tips to Improve Pencil Grasp – If your child struggles with holding a pencil efficiently, there are lots of easy little tricks we OTs like to use to promote stronger, more effective grasp patterns on writing utensils. 2 || Prewriting Strategies for Kids – There are a lot of foundation skills kids need before they can demonstrate efficient and legible handwriting. Learn about prewriting skills and how to support your child. 3 || Handwriting and Letter Formation and Construction – When kids practice making letters the wrong way over weeks and months, they form bad writing habits that are very hard to break. Learn the difference between letter formation and letter construction and how to help! 4 || Handwriting and Letter Sizing – Do you have a little one who, when given a blank page, will cover the entire space with huge, giant letters? Or maybe your kiddo is on the opposite end of things, leaning in close and making teeny, tiny little letters. Read more about how to help kids learn appropriate sizing. 5 || Handwriting and Alignment – Have you ever seen kids who write with “roller coaster letters”? The baseline of their letters and words seems to go up and down within the writing lines, like the hills of a roller coaster! These kids are struggling with alignment. Learn more about how to help! 6 || Handwriting and Spacing – Whether your kiddo’s letters and words are piled on top of each other with no spaces at all or there are huge gaps and spaces in the middle of words and sentences that don’t make any sense…here are some ideas to help kids leave adequate spacing in their writing. 7 || Handwriting Speed and Fluency – In my school based therapy practice, I get many referrals for students who are struggling with keeping up with the pace of written work in the classroom. 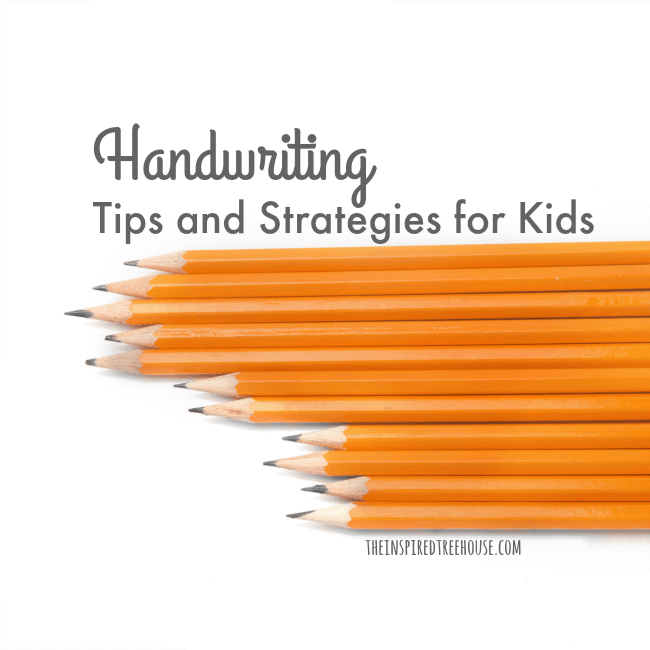 Learn some easy tips and strategies to improve handwriting speed. 8 || 15 Expert Tips to Help Kids Improve Handwriting – Some of our favorite ideas from other pediatric occupational therapists about how to help kids improve their handwriting! 9 || Assistive Technology for Kids Who Struggle With Handwriting – Many children have physical, cognitive, motor, and other limitations that so significantly impact their ability to write that they require alternative means of written expression. In these cases, there are several alternative options available. 10 || Handwriting Quick Tip for Sizing – Here’s an easy way to work on sizing of lowercase letters. 11 || Hand Dominance – Establishing hand dominance is an important milestone as kids develop prewriting and early writing skills. Learn more about how hand dominance develops and what to do if your child is struggling. 12 || Quick Tip for Developing an Efficient Pencil Grasp – Here are some quick ideas to promote using a tripod grasp early on and encourages these three fingers to work together.